Using these devices, researchers create plasma disturbances in the ionosphere and study their characteristics. “Currently, we use ionosondes of vertical and oblique sounding, a coherent radar, and incoherent scatter radars. Furthermore, ionosphere sounding is also performed by signals of low orbit and high orbit Earth satellites. 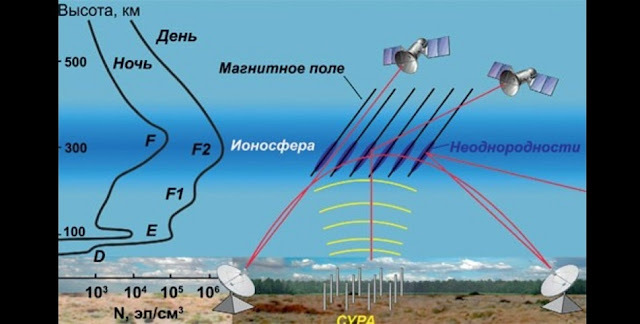 Recently, satellite methods of artificial plasma disturbance analysis have become more and more prominent; they help study the properties of both the excited and external parts of ionosphere, and even parts of ionosphere which magnetically conjugate to the heaters' location. “Experiments help us study interactions of electromagnetic waves with particles in a basically infinite plasma. So there are no chamber edge effects like in lab experiments. “Our paper details theoretical findings about plasma processes, including plasma fluctuation, high-frequency and low-frequency plasma turbulence. They lead to a significant heating of plasma and generate artificial irregularities of its density on scales from less than a meter to dozens and hundreds of kilometers, as well as to the acceleration of electrons to superthermal energies, which leads to additional ionization of plasma and generating of artificial optical emissions,” continues Dr. Frolov. According to him, ionosphere is basically a natural plasma laboratory facilitating many experiments in plasma physics, solar physics, planetary sciences, ionosphere and magnetosphere studies. The paper appeared in Space Science Review. There are times when a direct sales business needs an MLM Lawyer and not just a regular general practice attorney. You know you should call one when it applies to you.